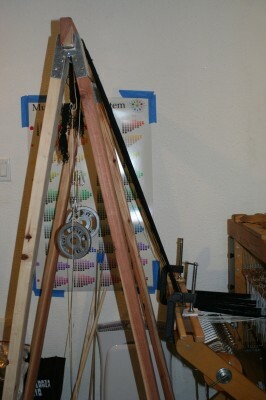 Here are some pics of the warping trapeze I built for my Macomber loom. I just put on my first warp using it, as you can see. I put two top beams on it so that I can use the bottom one as the warp gets closer to the end. You can't see the raddle very well because of the angle I used when I took the pictures, but it's there between the lease sticks and the lower beam. The best part is that there is no reason to take it off the loom - I don't see any reason why I can't weave with it in place. Unfortunately, I'm not going to get to this warp very soon. I beamed it during the hurricane and have been cleaning up the yard and a broken trellis ever since. I like it. It looks well thought out. I have just been putting my water jugs on the floor and running the warp either over the castle or just over the cloth beam and straight back to the back beam. This takes up much less room and is beautiful, too. Could you show us how it attaches to the loom, as well as how the raddle is attached? Thank you for showing and sharing! The advantage of this trapeze is that it is very easy to assemble and disassemble and takes up virtually no room in storage. The disadvantage is that you have to make certain the top is level and that the top beam is parallel to your warp beam, otherwise you run into trouble. I also found it best to wrap a teflon sheet (used for pressing seams in sewing,available from sewing shops) around the top of the beam. It's not as pretty as your trapeze and is probably fussier to work with, but it works well for me! Here are the pictures that show how I attach it to the loom. 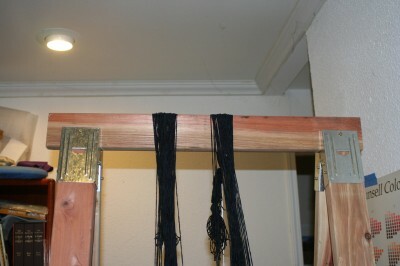 My loom has a home-made second warp beam, held away from the main back beam with a copper tube with a bolt through it. I screwed a small piece of wood to the bottom of the trapeze post and put two oak dowels into that. I hold it on with a bungie chord. You could do the same thing on the main beam, but your little flat board would would extend over both edges of the beam and the dowels would be installed differently. One would be in front and one in back of the warp beam. A bungee would also keep them from slipping off. The second pictures shows how I attach the raddle. This little "hinge" is something I found at the hardware store. I cut it off and installed a little screw to keep the part from falling off. The good thing is that it moves left and right, so the holes in the raddle don't need to be exact. This system works very well because it keeps the raddle at an exact right angle to the warp. Also, notice the little screw eye. That keeps the trapeze posts from sliding right or left. You could use these on the back beam also to keep everything in place. Screw eyes are good "place holders" because you can turn them to make things fit tightly. PS. I replaced the original pictures because they went blurry when I reduced the size. That makes it clearer. I see the raddle now. I was not looking at the picture right. The little hinge is a great idea. I'm interested in how you made your second warp beam also. I would like to put that on my list of to-do projects for the near future. I really appreciate your sharing your photos and information with us. You need a piece of wood for the second back beam. Attach it to the main beam but an inch or two back of it and a little higher. As you can see in that picture, I installed it with a bolt that goes through a piece of copper pipe. Very easy and insures that you can keep it the same distance away on both sides. And copper pipe is easy to cut with a plumbers cutting tool. Then you use another piece piece of wood for the second warp beam. I used a nice straight piece of 4 x 4 fur and ripped the corners off to get an octagon, which I sanded a lot to make it smooth. That is installed below the main warp beam. Where you install it will depend on the geometry of your loom. You will need to make sure that the two warps don't interfere with each other. For the friction brake and the parts to attach the beam to the support legs, I used replacement brake parts sold by Camilla Valley Yarns in Canada. I used the brake parts sold for the Leclerc Artistat loom. (For a table loom, use the parts sold for a Dorothy loom.) You will need a pedal to release the brake and to figure out how / where to install all this in such a way that it doesn't interfere with your main warp brake, etc. Camilla Valley Yarns is my favorite place for parts. They are also where I got the parts including the reed for the tapestry loom that I built. Would you or anyone on this thread consider making these (warping trapezes) to sell for those of us that don't have access to a wood shop? And, while we're at it, how about something other than a web cam, book light, and laptop that allows us to see the back of the fabric as we weave? I could use one of those, too. Does anyone else have a better solution to this problem? To me, computers are for work and weaving is for fun . . .
By the time you figure in all the materials (bought at retail prices) plus the time, no one will be able to beat the price of the Purrington trapeze. They only want $175 for it. Those clamps are expensive, but there are lots of less expensive ones available at Home Depo or Lowes. The only way building one pays is if you do it for yourself. The trapeze is easily done with nothing more than a drill, a small hand saw and a hack saw if you buy the long pieces already at the right size - like 3 x 3s. The second warp beam - that is a different matter and takes lots of tools. got the website . . .
Now, how about seeing the back of the fabric while weaving . . .? Ya, that's why I wanted to do one myself - because of ceiling height. I also wanted to warp over the loom to limit the space required behind the loom. I'm thinking that you could cut off those tall pieces and get a long straight dowel and install it like I did my top trapeze beam. The dowel should be 1.5 - 2" in diameter. (Stairway hand rails would work and are almost round - just sand the edges a little.) Then, get some 1/4" Al rod pieces about 2" long each, and drill two little holes - one in each end of the dowel and one on each of the tall pieces. Don't drill all the way through the tall support pieces because you want to make sure the AL rods don't rotate out while winding the warp. Put a washer on the Al rod between the dowel and the support pieces. If you are afraid the two tall support pieces will spread apart and drop the dowel - just put an eye hook on each of the support pieces and run a rope or bungee from one to the other. If I were going to make a saw horse version like Tien's, I'd make some small changes. For one, I'd attach right angle support brackets to the under side of each end of the top beam. Then, I'd use the bottom holes in the bracket to hold a piece of rod that fit into each end of a dowel and run my warp over the dowel instead of the top beam. A small hole in the rod and coddle pins would keep it from coming apart. Of course, you still have to figure out where to put your raddle and the lease sticks, etc., but that shouldn't be too hard. Thanks for taking the time to explain more. I like my warp to go over the castle when winding on, too. I will think more about the second beam. Thank you for your ideas and for sharing them with us. I have a question about how much weight for each chain of warp. My creative hubby built me a trapeze from his extra airplane parts (Lightweight yet super strong) and is attaching it to the ceiling so it won't be in the way of my weaving. I have a 60" Cranbrook and have 4 warp chains of 16/2 cotton, 1406 ends total, 5 yards in length. The planned weaving width will be 50" at 28 epi. My question: how much weight should I put on each chain? 5 lbs, 10 lbs, 2 lbs. Does anyone have any experience with the optimal weight to use or how to figure this out for different fibers? Well, if you were warping with a friend pulling on the chain instead of with a trapeze, how much "weight" would you tell your friend to pull with? You wouldn't know how to measure that, right? What I do is make sure each bout has the same number (or close to the same number) of warp threads, and then I fill the jugs all to the same height with the water. I usually use about 6 pounds per jug. It's a trial and error kind of thing. If the tension is enough to make the warping process work, then it's enough. One thing I would say, is don't try to do it with too few bouts. I usually weave 30" wide or so, and use 3 or 4 jugs. If you put too much width hanging from one jug, the threads at each side of the bout get more tension than the ones in the middle of the bout, especially as the jugs get closer to the top of the trapeze. The type of fiber doesn't really play into it. Any fiber can be spun into any weight, and can be well and strongly spun or badly spun. As Sally says, too wide a bout create tension problems. The most I will do is 15" of warp per chain. I use gallon jugs filled a little over half full. Have never weighed them but they give me the amount of tension I need. I have beamed linen, silk, rayon, wool, cotton using the same weight. Photos on my blog. Click on " warping valet" label. In the meantime, there is also Andreas Moeller's "Best Friend" which is a simple ladderlike frame that stands on the floor in front of the breast beam and threads the warp chain around 4 rungs as well as the knee beam, breast beam, and over the castle to create enough friction that one simply needs to threaad the long chain around the tension points and beam without weights at all. Photo is near bottom of page. Wrapping the warp around various fixed points on the loom is shown in many European weaving books - the ladder is just a nice addition. Of course, a handy husband holding the chain several feet from the loom is also a great "helper" or "hired hand" (the direct translation of Varpknekt.